In pretty much any walk of life, it's rarely a good idea to point-blank refuse to do what your boss tells you to. 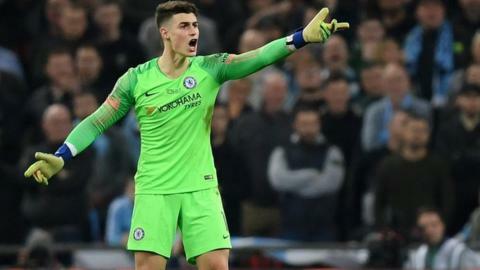 But that didn't stop Chelsea goalkeeper Kepa Arrizabalaga deciding to ignore manager Maurizio Sarri, who was trying to substitute him towards the end of Sunday's Carabao Cup final against Manchester City. With the game heading for penalties and Kepa earlier affected by cramp, Sarri wanted to bring on Willy Caballero, a goalkeeper with experience of saving spot-kicks in such a game - namely in the 2016 final against Liverpool, when he saved three for City. But Kepa refused to leave the pitch. Sarri shouted and waved - but Kepa was having none of it. And so he stayed on, while Sarri stormed off. In the shootout, Kepa saved only one - not quite getting down low enough to another which appeared stoppable - and City won. It has sparked debate about Kepa's future and Sarri's, with many of the opinion his authority had been fatally undermined. The dispute between India's veteran batting star Mithali Raj and her coach at the 2018 Women's T20 World Cup was so bitter and so protracted it became the subject of a full investigation from India's cricketing authorities. After Ramesh Powar declined to pick Raj for the opening game of the tournament, Raj, a mainstay of India's women's team across all formats for 15 years, packed her bags and threatened to quit cricket altogether unless she was selected - as opener - for the next match, against bitter rivals Pakistan. Powar said Raj had effectively "blackmailed" him into playing her. For her part, Raj felt she had been excluded by Powar and discriminated against. Regardless, Powar conceded the point, and Raj was named Player Of The Match against Pakistan. But Powar felt her slow run rate was putting the team at risk. Raj was then injured for the quarter-finals, but fit enough for the semi against England. Powar refused to pick her. India lost badly. Although India are now under a new coach, Raj is still not being picked, and her many years as a star of the side seem to be coming to a rather ignominious end. The 2018 Women's US Open final between Serena Williams and Naomi Osaka came to a somewhat sad and bitter end after Williams was given a code violation for coaching, incurred a point penalty for racquet smashing and was docked a game for verbal abuse. Williams called the umpire a "liar" and "thief" after he penalised her for receiving advice from coach Patrick Mouratoglou in the stands as Osaka won. Williams insisted she had not been coached. But Mouratoglou undermined that by saying he had, in fact, been sending her signals. "I just don't understand what he is talking about," Williams said. "He said he made a motion. So I was like, 'You made a motion and now you told people that you're coaching me - that doesn't make sense, why would you say that?'" Sometimes it is hard to know who is right and who is wrong when it comes to player-coach rows, even ones that take place in full view of packed arenas and global TV audiences. On other occasions, it is very clear. Take, for example, the 1997 Australian Grand Prix. Jean Alesi had started eighth for Benetton but had worked his way up through the field and was looking good for a podium, when his pit crew held out a sign telling him to stop for fuel. But when Alesi came round the next time, he drove straight past. So the team tried again. And again, Alesi continued down the main straight rather than peeling in. Worrying how low Alesi's fuel was getting, the pit crew grew even more desperate with their signalling. They resorted to grabbing the brightly coloured pit lollipop and waving it over the wall. And still Alesi ignored them. And so it was no surprise when - to Benetton's absolute exasperation - Alesi ended up parked by the side of the track, out of fuel, and with no roadside recovery assistant in sight. On TV, commentator Murray Walker noted that "you can see by the body language of the Benetton mechanics that they are absolutely FURIOUS". Alesi's boss Flavio Briatore was asked after the race what he would do if his driver did something similar again. He icily replied: "On the first lap he doesn't pit I'll wave a big gun. If he still doesn't stop, I'll start shooting." Relationships between athlete and coach can be tough at the best of times. But when you are husband and wife, it can really feel the strain. Such was the case when Paula Radcliffe came agonisingly close to a medal in the women's 10,000m in Edmonton in 2001. Lough was located just behind the finish line and was screaming tactical advice to Radcliffe. When she came in just behind Ethiopian athletes Derartu Tulu, Berhane Adere and Gete Wami, Lough confronted her - while she was in tears - to tell her what she had done wrong. It would likely now be called 'mansplaining', and it did not go down well with his wife, who pushed him away. "She's the runner and makes the decisions," Lough said. "I was out of order. I'm sorry. I've apologised and I hope she accepts it later." Radcliffe responded that she accepted that everyone had been "caught up in the emotion", but added that maybe - just maybe - "it wasn't the right time to tell me that I'd got it wrong". As much as there has been tension, anger and emotional strain, none of the conflicts mentioned so far have turned physical (Radcliffe's shove of her husband aside). But in the US, one of the most notorious intra-team rows did, back in the late 1990s. During training in Oakland, California, Golden State Warriors coach PJ Carlesimo criticised guard Latrell Sprewell for making lazy passes. Sprewell reacted - badly. He first told Carlesimo he would kill him. Carlesimo, however, continued his critique - and Sprewell grabbed him by the throat. Team-mates separated the two and Sprewell went to the locker room - only to return, punch Carlesimo and drag him to the ground. Sprewell was suspended for 68 games and his pay was docked for the rest of the NBA season. ''You see a lot of things over the course of a career, and you prepare for a lot of different scenarios, but, no, no one expects something like this,'' Carlesimo said.